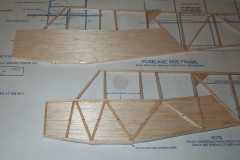 Paul's Planes Super Cub page! 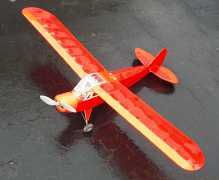 This is my Hobby Lobby Super Cub. 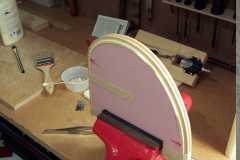 It seems like a very well designed kit, and I only made a few modifications to the original design. Power is a 6V Speed 400 with a Graupner 1700 series 2.33/1 gearbox controlled through a Aveox A15 ESC. 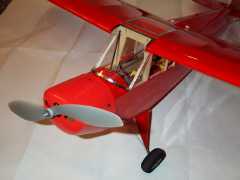 The flying prop will be a APC 10 x 4.7 Slowflyer prop. I have 2 batteries for this plane, Sanyo 600AE 7 and 8 cell packs. My Cub is covered with transparent orange Monokote. The radio I use is a Hitec Flash 5 System X with a 555 micro Rx and 2 HS-81 servos. Final weight of 20 ounces. Visit AERO CRAFT, the manufacturer of the Hobby Lobby Super Cub. 1. 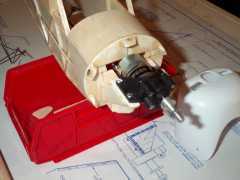 Added 1/16 sheeting to the lower forward inside of the cabin sides. 2. New front wing mount former with longer legs to transfer the wing loads better. 3. 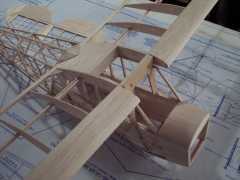 I used 3 strips instead of 2 to form the wingtips and stabilizer front. 4. 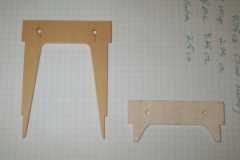 Added gussets similar to the former in item #2 to the rear wing mounting plate. 5. 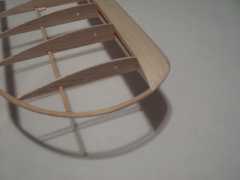 Solid balsa rear wing/fuselage fairing to strengthen wing bolt area of wing. 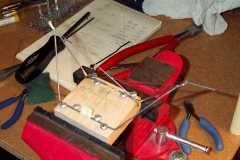 I will add photos and weights as construction progresses. If you have any comments or questions about the Cub please e-mail me. Click on any of the pictures to see the full size photograph.